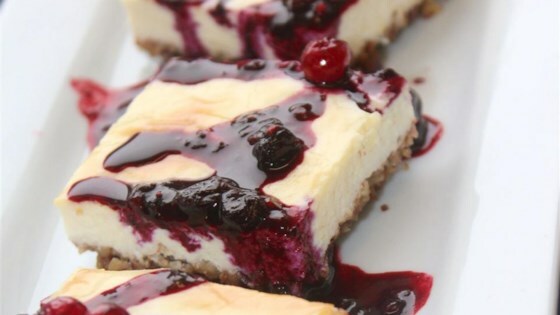 "These cheesecake bars are an excellent sweet on a low-carb or keto lifestyle." Add pecans to a food processor and chop very finely. Add sweetener, cinnamon, and nutmeg and process for a few more seconds. Pour mixture into a bowl and add melted butter. Stir together and press crust mixture into the bottom of a divided brownie pan with the divider removed. Beat egg until fluffy in a large bowl with an electric mixer. Mix in cream cheese 1 ounce at a time. Beat mixture until cream cheese is smooth. Add sweetener, sour cream, vanilla extract, and almond milk. Beat together until filling is smooth. Stir in melted butter. Pour filling over the crust in the brownie pan. Insert divider into the pan. Meanwhile, heat a small pot over medium heat. Add mixed berries and sweetener and bring to a simmer, about 5 minutes. Stir berries and crush some with a spoon so that a liquid starts to form. Cook for about 10 minutes more. Allow cheesecake bars to cool in the brownie pan, about 1 hour. Pour berry sauce on top of bars. Part creamy cheesecake, part light lemon bars—it’s the best of both worlds. I used that square brownie pan where the divider lifts out in the middle, but you can use a regular springform pan. OMG----- These are delicious. With or without the berries! I am the only one doing Keto, but my whole family loved them! Thanks for the Keto dessert!!! This is definitely going to be a favorite. Even though I made the mistake of making it the day before so it was soggy on the bottom everybody LOVED it! It still tasted delicious. Fabulous! I don’t have the brownie pan and didn’t really want to use a springform pan so are used a regular Pyrex baking dish. Awesome dessert!